In letter, Gottheimer won't say "Islamic terrorism"
In a correspondence sent out using taxpayer money, Democrat Congressman Josh Gottheimer tip-toed around the major cause of terrorism in the world today, willfully ignoring it by calling it by another, politically-correct name. As your Representative, I value hearing directly from residents of northern New Jersey about the issues that matter to you. I want to make sure you know that I will be hosting a live Telephone Town Hall from my office in Washington at 7:30pm tomorrow. We will discuss important updates on legislation to lower taxes, protect our seniors, help our vets, fight lone wolf terrorism, fix our roads and bridges, and stand by our first responders. It wasn't "lone wolf" terrorism that necessitated the creation of the Department of Homeland Security and the billions spent since. The Congressman should not ignore the fact that these have been coordinated attacks and that ISIS, the Taliban, Hezbollah, and such are all strains of the same anti-Western, Jihadist ideology. They differ -- as Stalin and Mao did -- but remain focused on the destruction of America and Western civilization. Congressman Gottheimer still hasn't called out his party's leaders for their support of Linda Sarsour, the co-chair of the Women's March, and a self-proclaimed advocate of "jihad" against the democratically elected American government. Yes, the co-chair of the Women's March actually called for "jihad" against the government of the United States of America. And Democrats have mostly remained politically-correct silent about it. Instead, state and local Democrat leaders have praised the Women's March and continue to do so -- lending their support to its leadership while American troops are in the field, engaged in a fight against jihadists. Why have the Democrats and their candidates refused to comment on these threats of "jihad"? During a speech to the Islamic Society of North America convention in Chicago last weekend, Sarsour, a delegate to the 2016 Democratic National Convention who is an anti-Israel and pro-Sharia activist, made the startling call and also urged against "assimilation." "I hope that we when we stand up to those who oppress our communities that Allah accepts from us that as a form of jihad," she said. "That we are struggling against tyrants and rulers not only abroad in the Middle East or in the other side of the world, but here in these United States of America, where you have fascists and white supremacists and Islamophobes reigning in the White House." "Our number one and top priority is to protect and defend our community, it is not to assimilate and please any other people and authority," she said. "Our obligation is to our young people, is to our women, to make sure our women are protected in our community. Our top priority and even higher than all those other priorities is to please Allah and only Allah," she said. Since the election of Donald Trump as President, some Democrats appear to have gone completely loopy. We believe that dissent is an American right, but "dissent" isn't "jihad". When did the democratic concept of a "loyal opposition" morph into "jihad" -- a "holy war" to be waged by all means necessary? And why are Democrats and their candidates too afraid to talk about it? And here is another thing that they are afraid to comment on. 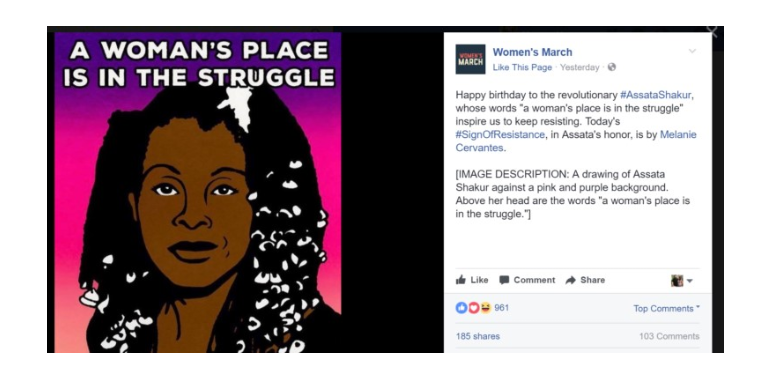 It was reported extensively in the media last week that the Women's March "honored" cop-killer Joanne Chesimard (aka Assata Shakur). We haven't heard from Congressman Gottheimer and other Democrats. Why have they remained silent? Why don't some Democrats appear to mind associating with radicals calling for "jihad" and cop-killers? Do they consider these legitimate forms of "dissent"? We are very interested in hearing what Congressman Gottheimer and other Democrats have to say about a group, that Democrats strongly support, honoring a cop-killer.